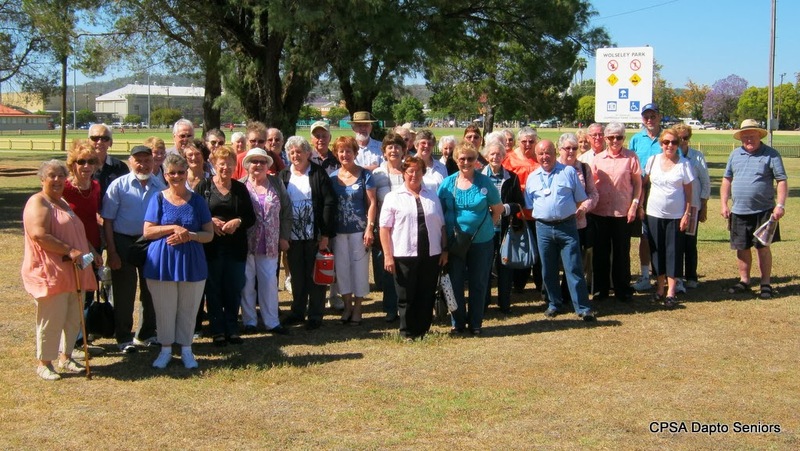 October 2013 will be a memorable month for twenty four happy club members who have just returned from a week's holiday in Moree. It seems to be the consensus that everybody had a wonderful time and they are looking forward to the next holiday which should be a ripper too. This was the group on the way home when they stopped for morning tea in Gunnedah. We shared the coach and all our trips with a similarly sized group from Toongabbie in Sydney. Everybody got on famously. Our thanks go out to Sue who organised this enjoyable event but who, because of illness, was unable to come with us. We all hope she will be able to join us on the Autumn holiday. Bathing in the hot Artesian Pool. A visit to the largest Pecan Farm in the world. Venturing into Queensland for a visit and tour of Goodiwindi. Cotton farm and irrigation tour (so interesting). If you would like to come on the next trip listen out for news at a future meeting and put your name down. You can pay in instalments if you prefer. It will be great to have you join us. Who would have thought it? Astound your friends on trivia night. Charles Dickens' youngest son is buried in Moree Cemetery.